I am sure you know by now that our classmate Eric Zucker passed away this weekend. Although we all knew Eric Zucker in varying degrees and in our own ways, WE ALL KNEW ERIC. Whether we were very close to him and had daily interactions or only saw him at reunions every 10 years, WE ALL KNEW ERIC. He had a smile that would light up a room and a laugh that was infectious. Whether we knew him as a friend or just a classmate. Whether we cheered his athletic prowess on the Cross Country Course or only were entertained by his antics as yell leader and King Regent on the sidelines of football games on friday nights, WE ALL KNEW ERIC. He had a face you could never forget and the kind of character that you were honored to have known. Whether he was debating his point with passion or just telling you the latest joke. Whether he was impressing you with his keen intellect or his overwhelming desire to help his fellow man, WE ALL KNEW ERIC. What we don’t know is how his wife and family will be forever changed by his absence, how horribly his friends, co-workers and classmates will miss him, how many more people he would have touched and helped in his lifetime, how much more he would have done, how his grandchildren would have loved him. What we do know is how blessed we all were to have known Eric and been touched by him in some way. WE ALL KNEW ERIC WAS SPECIAL. Our classmate and good friend passed away. Eric Zucker passed away after a bout with brain cancer. American Legion Award, Cross Country team 3 years, Boys’ State, Reseda High School Faculty Scholarship. After Reseda, Eric went to UCLA, then on to Hofstra University School of Law. He was a Los Angeles County deputy public defender. Survivors include his wife Donna, their three children, and Eric’s brother Mark. 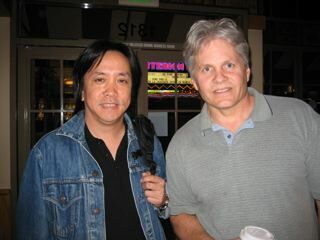 Other schools Eric attended: Newcastle Avenue Elementary Class of 1971, and Sequoia Junior High Class of 1974, both schools in Reseda. Thank you Eric for sharing your strength, wit, humor, kindness, courage, and amazing life. 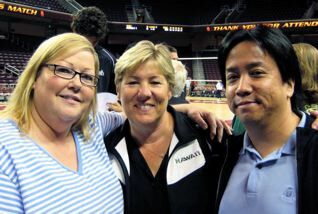 A few of us went down to USC to watch Dona Bunzel’s son, Matt play volleyball. 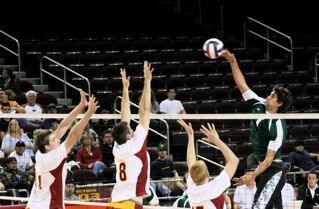 Matt Rawson is a middle blocker for the University of Hawaii men’s team. UH won in 5 games. Real good, exciting match. Galen Center is pretty cool. Ran into a couple of 1979 Reseda alumni. All photos taken March 22, 2008, Los Angeles. 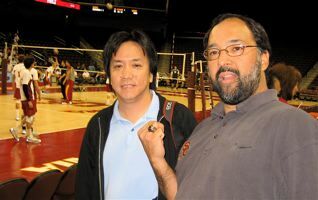 as a member of the USC men’s volleyball team. Matt, #1, up to block. Debbie and Dona. Photo by Michael Nikaido. 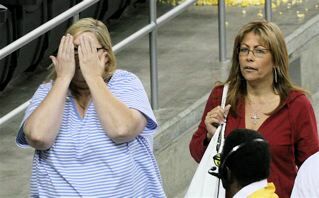 Debbie and sister Michelle (Reseda class of 1979). UH is scheduled to play CSUN, at CSUN on 3/25 and 3/26/08. 50th Bash Meeting Minutes, March 13, 2008, Van Nuys. Josie, and special guests JOANNE and JANET. During our meeting, Janet Moshin joined us by phone to discuss the potential of hosting the birthday bash at her winery. During our discussions, it became evident that her winery did not have enough space to accommodate our group as most of the winery and adjoining vineyards are built on a slope. We further learned that the church retreat/camp next door was already booked for next year. To further complicate matters were the questions concerning logistics in getting to the winery which is located outside Santa Rosa in NorCal. 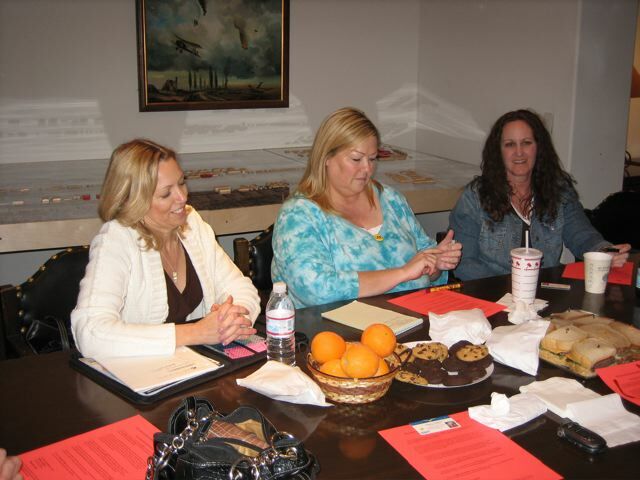 After much discussion, teasing and joking, and with the help of Joanne Disbrow Williams who attended her husband’s class B-day party in Vegas and provided us with some great info, we came up with the following plan of action. Vegas has good economical plans that are suited to accommodate large groups. The group party Joanne was with rented a large suite in the Bellagio that can accommodate up to 100 people. They used the suite as the meeting and party room. The great thing about the Bellagio is that it is centrally located on the strip. In this plan, each person books their own room in their hotel of choice and everyone helps pitch in to pay for the Bellagio suite. Food can be ordered through the Hotel or everyone can bring something. The suite is 1200 square feet large. We can plan activities to do within the suite and we can also plan group meals with the hotel or some of the other larger restaurants in Vegas (what about the cavernous Hofbrau Haus across from the Hard Rock), shopping trips or other activities such as attending a show, concert etc. In order to get the best deal, the idea is to book the party for a Saturday/Sunday with check out on Monday. There was the suggestion that we book a winery in the Santa Ynez Valley within the Santa Barbara Wine Country. Randy Farber will look into the cost and availability of a weekend catered party at a winery. What is appealing with this idea is that those living within SoCal do not necessarily have to stay overnight and the trip is relatively short. Another plus is the great wines coming out of Santa Ynez. Plan C: Queen Mary, yes, the one in Long Beach. There was also the suggestion of having the party somewhere local such as the Queen Mary in Long Beach. There are plenty of hotels and other accommodations in the area and for those of us who live in SoCal, we don’t have to spend the night. Debbie Mollner will look into the Queen. One of Tammy’s employers is an owner of the Las Vegas Hilton, she will see if we can get a good deal on rooms and maybe a meeting space. Someone mentioned the Hilton is connected to the strip via the monorail and could be a great party local. We do not have a date planned as yet as we intend to plan the event around spring break and kid stuff (as a result, March and April are out). We will also see what part of the year we can get the most bang for our buck. 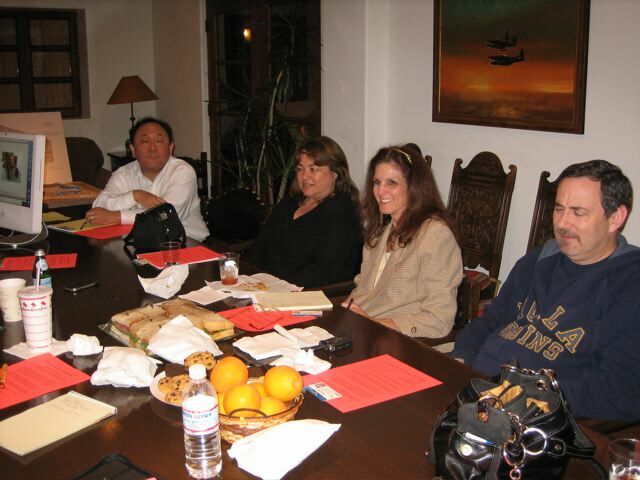 NEXT MEETING: APRIL 8, 2008 @ 7:00 PM MAGUIRE AVIATION AT VAN NUYS AIRPORT. Thanks again to Tammy and the kind people at Maguire Aviation for hosting our meetings. Due a Do? New digs? Fun conversation? 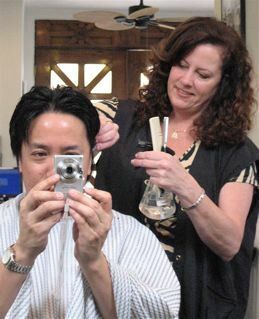 Julie Lagerwall is a hair stylist at the Casablanca Salon in Sherman Oaks. She is also a talented make-up artist and real estate agent. Make an appointment with Julie Riddell. hung out with us “older” guys. Dave says hello to the class of 1977. Photo taken 3/10/08, Santa Monica. 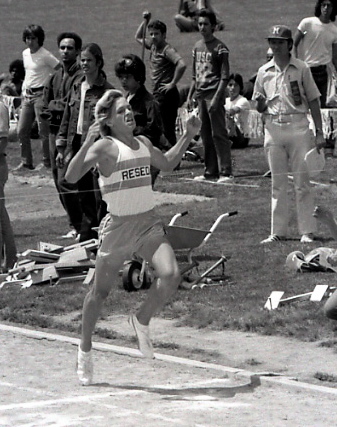 David Bushnell crossing the finish line as the 1976 LA City, Class Bee 880 Champion, 1:57.5. Photo at East LA College.